After using this platform for months, I have finally gained some experience to share a guide here. 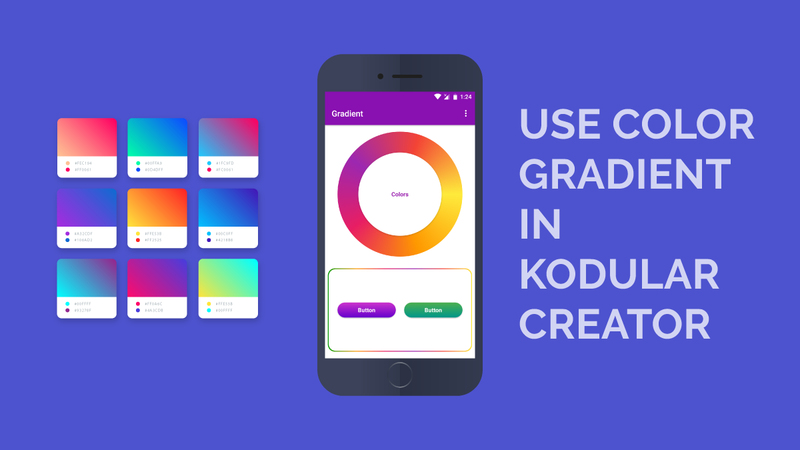 In this guide I will show you how to use Color Gradient in Kodular elements like Horizontal Arrangements, Vertical Arrangements, Buttons etc. along with demo in a video tutorial. 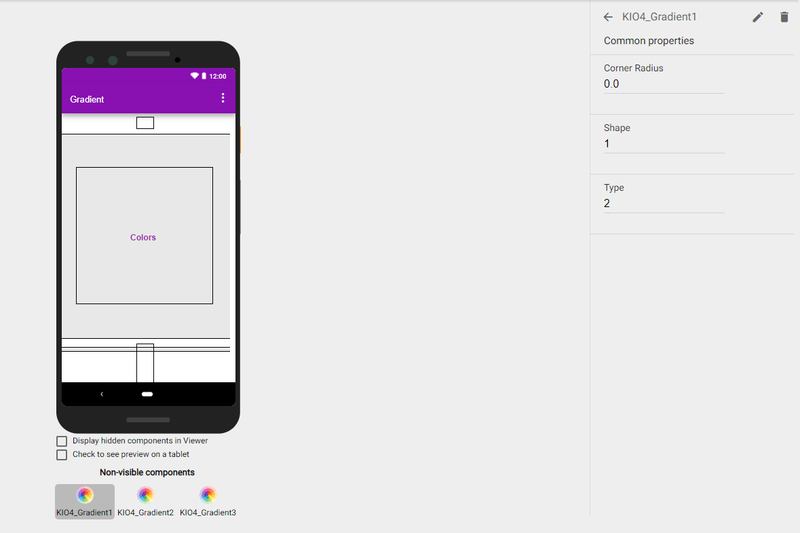 Well, there is already a known method to use Gradient Effect in Kodular, that is by using a background image with gradient color (which you can easily download from https://gradienthunt.com/). But if that is the solution, then there is no point in writing this guide. So, there is a better method. Well, I know there are paid extensions for Gradient Effect. But here I am going to share with you a totally free extension for the very effect. It is a non-visible component and is only used with the layout components: Vertical Arrangement and Horizontal Arrangement . After adding it to your project, you will find it’s design view and block view. Let’s discuss each view one by one. Corner Radius: Using this property one can add rounded corners to vertical and horizontal arrangements. Shape: For this property you can use intergers from 0 to 3 for Line, Oval, Rectangle and Ring shapes respectively. Type: Using this property one can select the style of gradient i.e., Linear Gradient , Radial Gradient and Sweep Gradient for the values 0 , 1 and 2 respectively. Orientation: You can have eight orientations for you color gradient. It can have an integer block with value from 1 to 8 for orientations defined in developer.android.com. 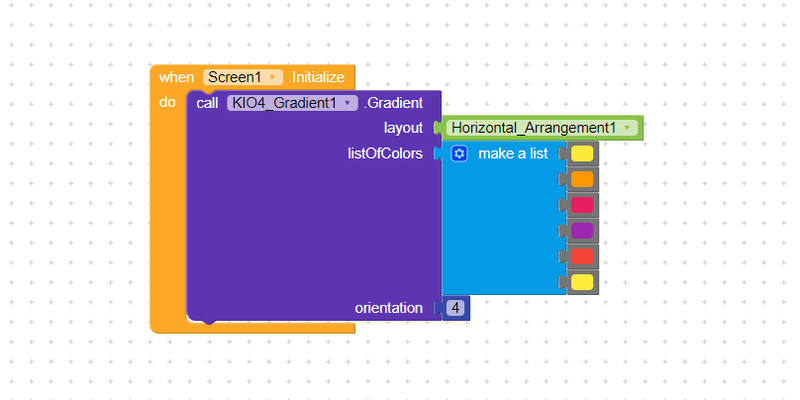 How to Use HEX Color Codes with KIO4 Gradient? Yeah, that’s true @DjJohn07 , I have discussed about that in the video. But still we can create awesome designs from what’s available. I have updated the OP with a video tutorial to use HEX Codes with the Gradient Extension. Please check that out.